Referee: Craig Pawson - A mixed bag from the Yorkshireman who had also taken charge of our 1-4 defeat at Old Trafford in November 2017. The decision to penalise Smalling for diving was pivotal to our victory, given that the goal stemmed directly from the free kick. The failure to award a penalty in the first half when Gayle went over was frustrating but our initial call matched Pawson's. What did grate was his indifference to blatant territory stealing by Man U at free kicks and throw-ins - exacerbated by blowing for one marginal gain by a Newcastle player. Perhaps the biggest "what if" though was booking Antonio Valenica following his high kick into the face of Christian Atsu. Had the boot been on Jonjo Shelvey's foot, it's tempting to think that heavier sanction would have followed. The recent passing of ex-player Vic Keeble, former club doctor Keith Beveridge and young fan Frankie Sherwood was marked by a minute's applause before kick-off. The recently-deceased Manchester United old boy Liam Miller was also honoured at the same time, his photo added to a montage displayed on the scoreboard. His former side wore black armbands in his memory. 65 mins Visiting defender Chris Smalling was booked for a dive inside his own half as he pretended to fall over Jonjo Shelvey's challenge and fittingly it was Jonjo who delivered the free kick that Florian Lejeune headed across the box. "When you play a top side like Manchester United you know every ball is important because if you make a mistake they will punish you. You have to work like they did today, it was an amazing effort. "We were doing well for a while and then we were defending but the teamwork and the way they fought for every ball was amazing. I am really pleased for the players and the fans because we did it here at home. "We have had some games where in the last five or 10 minutes where we have conceded and today we were a bit lucky in some of the shots they had. "But still the team worked so hard and in this kind of game anything can happen. We showed the character, passion and commitment that we have shown for the rest of the season. "You have to win games if you want go up the table. To do it in the way we did it - against Manchester United - is a massive achievement for these players. I’m really pleased because it was at home, in front of our fans - they needed a game like this one. "My message to our fans, and I think they know it really well, is that this is a team that cares. The players do not give up and they continue working hard. You could still see this was another game when they were giving everything. If we understand that and we are behind the players, they can perform like today. "Hopefully, it will not be my biggest win with Newcastle - hopefully, we will have bigger wins than this one, but it was a really great game against a very good team, a top side, who everybody knows how good they are. "We did well, although still we were a little bit lucky at the end. But I think the team deserved the three points." "Jonjo has quality on the ball. He is learning and if he can make the right decisions he is a very good player." "He can buy the lottery and win today. He was composed and that gave confidence to the team. He was doing well. It was his first game, and to keep a clean sheet against Manchester United is fantastic for him. "But it wasn't just about the goalkeeper: it was about everybody working together and working as hard as they did today and trying to defend." "Newcastle’s players gave the sacrifices all managers like to see. Were they lucky? Yes. But sometimes you deserve that luck. They fought for their lives and that’s a beautiful thing in football. "My verdict is that we could've been here for 10 hours and not scored a goal. Newcastle played with their lives and defended with their lives. "They got from us a defensive mistake and from a lateral free-kick they scored. The gods of football were clearly on their side. They must have an amazing feeling after giving absolutely everything. "Sir Bobby Robson told me after some defeats don't be so sad and think of the happiness of the other guys. I have that smile but I am disappointed. We did more than enough to leave without a defeat. "It is not a dangerous free kick (for the goal). Players were in position. But we miss the challenge in the air. I remember with my memory a Newcastle player jumping and two of my players looking at him and staying on the floor. "It is more logical to complain about missing a challenge in the air and missing the second ball. I have to be disappointed. “We train, work, organise. Players have their individual jobs. The players have their responsibilities. You know who lost the challenge in the air. It is difficult to be in a position to criticise my player. "I wanted a better way to come out in the first phase against a team that was defending in a very compact block. I was trying that with the simplicity of Michael Carrick because he tries to make everything simple and bring Alexis in an area close to Lukaku where he can be like a second striker. "I think it's difficult honestly, I've always felt (they are) beautiful matches but difficult matches. "I like to go there, I like the feeling of going to Mr Robson's home....I like the stadium, I think the stadium is really nice. I like the atmosphere, They are a good, enthusiastic crowd. I like the Geordies, I like to go there." Newcastle ended a winless sequence of eight home Premier League games - their equal worst PL sequence in a season, between December 2008 and April 2009. Jose Mourinho has now failed to win any of his seven Premier League games at SJP in charge of Chelsea and Manchester United (four losses, three draws). He has won twice here in the League Cup with Chelsea. The meeting of these two United's ended in our favour for the first time in seven games, since Newcastle's single goal success at Old Trafford in 2013 and this was the only the sixth time Newcastle have beaten Manchester United in 46 Premier League meetings. Matt Ritchie scored his first Premier League goal for us, the 135th different Newcastle player to do that in the Premier League. He ended his club scoring drought at the 28th time of asking, having netted his 16th and last Toon goal against Preston North End at SJP last April. Although Hampshire-born, he is the seventh Scottish international to find the net in the Premier League for the Magpies, after Alex Mathie, Stephen Glass, Paul Dalglish, Duncan Ferguson, Kevin Gallacher and Steve Caldwell. DeAndre Yedlin completed a half century of league appearances for Newcastle (42 starts). Martin Dubravka made a memorable debut for the club, the 222nd player to represent us in the Premier League and the first Slovakian to do so (fellow countryman Lubo Satka was an unused PL substitute but only played in the FAC). Just two of the 14 players used by Steve McClaren for the last meeting of these two sides on Tyneside in January 2016 were in action today - Paul Dummett and Ayoze Perez. The visitors fielded had six surviving players in action today. And sometimes it all just works - and reminds you just why you do this to yourself. 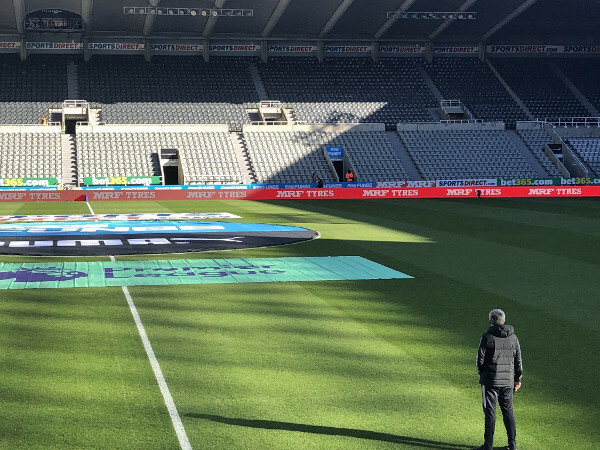 Matt Ritchie chose the perfect moment to net his first of the season, sending St. James' Park into ecstasy and ultimately handing Rafa Benitez his biggest win as manager of Newcastle United. The Magpies winger has struggled to make an impact recently and as designated penalty taker had the ill-fortune not to be on the field when a rare spot kick came our way in the last home game. He found himself in exactly the right place today though, striking a moving ball twelve yards away from goal to prompt wild celebrations on and off the field. 25 second half minutes remained when Ritchie applied the finishing touch to a move involving Jonjo Shelvey, Florian Lejeune and Dwight Gayle. A quartet of players who for various reasons haven't given full value so far this season finally came good when it mattered. And oh, did it matter. This was a day to live long in the memory; a glorious evocation of times past. Seven successive failures to win here since October. Penalty misses, late equalisers, own goals, all forgotten at the wave of a foot and the smack of a boot. Moments of pleasure: the sheer delight of the ball hitting the net, a similar celebratory release of emotion when the final attack was snuffed out, the spine-tingling cheer at the final whistle or the post-match euphoria across the city and beyond. All precious, all wonderful. Add in a clutch of brilliant performances across the field plus the most memorable of goalkeeping debuts, and you have all the ingredients of a classic, unexpected result. So contrary, so NUFC. The players - and manager - deservedly milked the applause after full time, as reluctant to leave the field as celebrating fans were to abandon their places in the stands. Today, somebody fell in love with Newcastle United. Those of us already condemned to a lifetime of unrequited adoration meanwhile received a much-needed boost. It's not all for nothing. Not quite. We'd reflected after the point at Palace that we needed to start taking points off sides in the top half of the table, but had barely considered that it would come to pass so quickly. Huddersfield's 4-1 victory over Bournemouth earlier on Sunday had briefly seen Rafa's side drop down to 18th spot and news that Islam Slimani wasn't fit enough to even claim a place on the bench threaten to further overshadow what looked like being a long afternoon. Seeing the final seconds of that Terriers game on a TV in the ground brought back unpleasant memories of the 2008/09 season, when we often seemed to be kicking off immediately after Big Sham's Blackburn Rovers had scraped priceless Premier League points in front of the cameras. That proved not to be the case today though as for once we responded positively, rose to the challenge and made a virtue of adversity. Slimani's absence was soon forgotten, as those selected set about their task with relish. The only buses parked here today were out on Barrack Road. 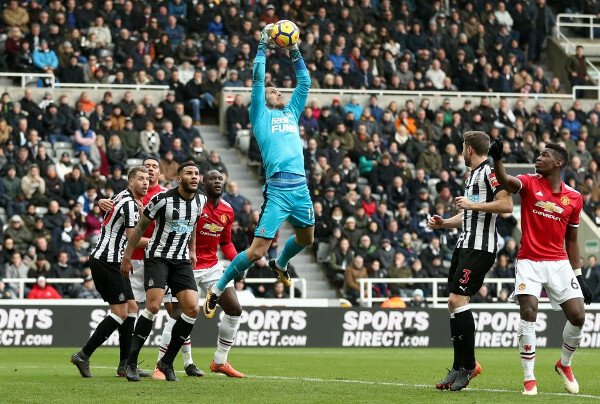 Newcastle certainly enjoyed elements of good fortune - not least when Dwight Gayle of all people blocked two close-range efforts from Anthony Martial late on - but this priceless victory was by no means lucky and by the end of 95 minutes, thoroughly deserved. Some outstanding home performances were the bedrock of this victory. Jonjo Shelvey took the man of the match plaudits and some of his link-up play with Mo Diame in central midfield was an absolute joy, while Paul Dummett once again showed his value to the side. Accolades also rightly went to debutant goalkeeper Martin Dubravka, who made several tremendous saves, commanded his area well and distributed the ball reliably and consistently. As if underlining his talent and confidence on the ball, his first two touches were with his feet before rushing off his line and an assured claim - quite literally taking his Premier League chance with both hands. All fourteen home players put in the shift of their lives though to bring the awful winless home run to an incredible and unpredictable end, the three points taking them out of the relegation zone up to 13th in the Premier League. Ritchie's strike came in the 65th minute leaving Rafa's side half an hour to hang on, which they did with great tenacity and determination, although the visitors had several chances to equalise. Big bucks buy Alexis Sanchez wasted a chance to shoot into an open goal as DeAndre Yedlin's challenge forced him wide and then Florian Lejeune took advantage of Sanchez's hesitation to block. But referee Craig Pawson had also denied Gayle a clear penalty in the first half when Chris Smalling clipped him just inside the box in the first half and David De Gea had to be at his best to deny Shelvey in a very positive opening 45 minutes. The decisive moment came when Smalling was booked for a dive inside his own half as he pretended to fall over Shelvey's challenge and fittingly it was Jonjo who delivered the cross for Lejeune to head across the box, Gayle to flick on and Ritchie to belt home. Jose Mourinho had already made a double substitution that worked in our favour as Paul Pogba and Jesse Lingard were withdrawn, former Magpie junior 36 year-old Michael Carrick appearing here for perhaps the last time - 18 years after he first came visiting with West Ham. The pressure was almost unbearable for the remainder of the game but our sheer resilience was heartening - bodies thrown in the way of shots (with the possible exception of substitute Joselu, seemingly more worried about his looks when hesitating to challenge for a 50/50 ball on halfway). An agonising series of corners during four added minutes concluded with Dubravka pulling off a smart one-handed save deep into added time, collapsing on the ball when it was played back into his area - and then looking up with a sly grin. Job done. Given the contrasting fortunes of these two clubs since the "Howay 5-0" days, there's a certain irony in describing the fervour on display here today as a cup tie atmosphere. Extending that analogy, the current financial climate and uneven playing field makes this Newcastle victory a giant-killing and unkind jibes of the "1-0 in your cup final" variety have a level of accuracy. Hopefully today marked another staging point in a season that began to nose dive when a 1-1 draw against Liverpool was immediately overshadowed by takeover talk and levels of fan unrest rose. Regardless of your point of view over the validity or otherwise of the bids, the whole soap opera had a de-stabilising effect on club and fans alike: if only for poking the owner with a stick and upping paranoia levels on both sides as to media complicity in managing their respective messages. Rafa's comments in the aftermath of the last transfer window spoke not only of the importance of adding to his squad but also moving players on. The desire for a striker was universal and correct, but getting Aleksandar Mitrovic and Jack Colback out of the postcode was also a priority. Rather than the received wisdom that we did better today because there was less pressure in facing "a big team", a improving level of squad unity and common purpose may have been more telling. Two defeats in nine games (both to Manchester City) and 13 points gained. Eleven games to play and our destiny is in our own hands. Like today though, we can't rely on anyone else to help us, it needs to be all our own work. If the third loanee emulates the other two, we might be in business.